The mostly dry Chiredzi district in southeastern Zimbabwe will grow drier as rainfall becomes increasingly uncertain, but trophy hunting and rearing crocodiles for their meat and skins can become major money earners to help rural households overcome poverty while adapting to climate change. In one of several initiatives under a project backed by the UN and government, elephants, warthogs, giraffes, buffaloes and impala - a type of antelope - are kept in an area measuring about 7,000 square kilometres and sold to trophy hunters licensed by the government in cooperation with the district authorities, while the community gets free meat from the slain animals. "The project is now well established and the beneficiaries are building a school and a clinic from the money they receive from the sale of the animals," said Leonard Unganyi, who manages the project run jointly by the UN Development Programme (UNDP) and the government-controlled Environment Management Agency (EMA). "They have also bought a truck and set up a grain-grinding mill to benefit the community." He said the project, which helps communities cope with drought and climate change, would be replicated in other parts of the country because 90 percent of Zimbabwean farmers depend on rain-fed agriculture and are struggling to become food secure. Using revenue from community-based trophy hunting initiatives to generate income for sustainable development activities is not unusual. In the late 1990s, Pakistan pioneered development of the Community Based Trophy Hunting Programme (CBTHP), according to the UN Environment Programme (UNEP). Pakistan runs several such projects, some in collaboration with UN and nature conservation agencies. Finding sources of income to build the resilience of poor rural communities to erratic rainfall in Zimbabwe’s troubled economy is a tall order. "Chiredzi district, which has always been vulnerable to drought, is one of the many areas countrywide that have been affected by climate change. Households have been severely affected by rainfall distribution, resulting in poor harvests," said UNDP-EMA's Unganyi. Susan Chivambu agreed. "There were hardly any rains to talk about in the last agricultural season and my family only managed to produce a few bags of maize. Very soon that will be gone and we will have to scrounge for food, just like we have done in the last three years." Her family has been forced to sell some of their livestock every year. "Even though we have a garden, we cannot sell the vegetables because there is no one to buy," she said. Two goats she would be taking to the market for the fortnightly sale were tethered to a nearby tree. "Adaptation to climate change is a fairly new phenomenon in Zimbabwe," said Unganyi. "There is a need for policies and strategies that empower affected local communities." Tapping into another lucrative market, 300 households in Chilonga village in Chiredzi district have set up a cooperative crocodile farming project, now in its second year and close to becoming profitable. Each member contributes to the food and upkeep of the crocodiles. The villagers have benefited from infrastructure left behind by a white commercial farmer, including ponds, incubators and boilers. William Tonono, a member of the crocodile project, told IRIN that they were rearing 880 crocodiles, some of which were ready for market. "Even though we still have problems raising money to buy food and medicines for the crocodiles, we hope that when we sell our first batch, money problems will be a thing of the past," said Tonono. Zimbabwe’s export earnings from crocodile meat and skins are worth millions of dollars. A skin 40cm wide is valued at US$9 per centimetre, according to Padenga, a Zimbabwean company that trades in skins. UNDP-EMA will help the cooperative to market their produce. "Our aim is to make sure that the money we realise from this project will be enough to provide our family needs, but judging by our progress, we will be able to buy cars in the near future," Tonono said. Another initiative gives rural residents an alternative to dependence on their dwindling livestock. Families where Chivambu lives have been organized into clubs that breed fish in the nearby Masukwe Dam. They hope to harvest the first batch of fish by the end of 2011. Other families have been given the option of farming hardier crops like cassava, and small grains like sorghum and millet which thrive in dry conditions, but the results have been mixed. 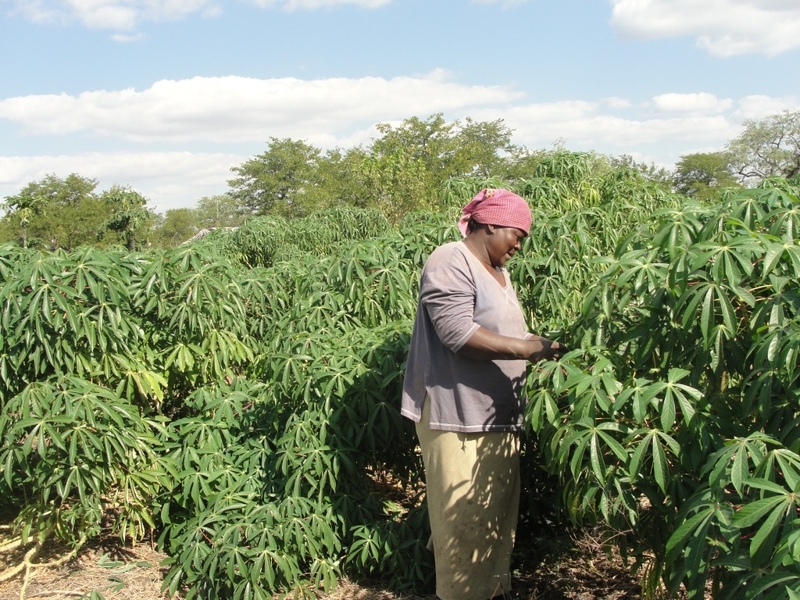 Evelyn Hanyani’s cassava crop thrived and she hopes to sell some of the produce to support her family of 15, but her sorghum crop performed poorly, partly because of long dry spell in February 2011. "We cook the cassava every morning and use it as a substitute for bread,” she said. We also grind it to prepare flour for bread, and sometimes use the ground powder in the place of maize-meal and pick the leaves to use as vegetables." Her neighbour, Tsotsowani Makondo, 40, a mother of nine, opted to grow small grains. "Despite the drought in the area this year, I am happy with my yields. My family will not die of hunger because I harvested enough sorghum and millet to last me ‘til next year," Makondo told IRIN. Her children are not used to eating millet and sorghum instead of Zimbabwe’s staple food, maize-meal, so she sells some of her produce to buy maize. The Famine Early Warning Systems Network (FEWS-NET) notes in its report on Zimbabwe in June 2011 that staple cereals are readily available nationally, but prices are higher than the same time in 2010. Predominantly rural districts like Chiredzi have not shown improved sources of income for poor households compared to a year ago. The districts of Chiredzi, Buhera, Mangwe, Bikita, and Mutare reported the highest maize grain prices in Zimbabwe. FEWS-NET said the trend was likely to continue to 2012 because of the poor harvests in these areas. "This means access challenges for the poor households in the areas of concern will have worsened, and more households will be food insecure."